I've really gotten into the spirit of Autumn this year, I've been feeling very seasonal! I feel like Autumn/Winter is really when I have to stockpile candles for the rest of the year, I'm a sucker for the sweet, rich, spicy scents, they call my name! So this time of year is where my kind of candles come out to play! 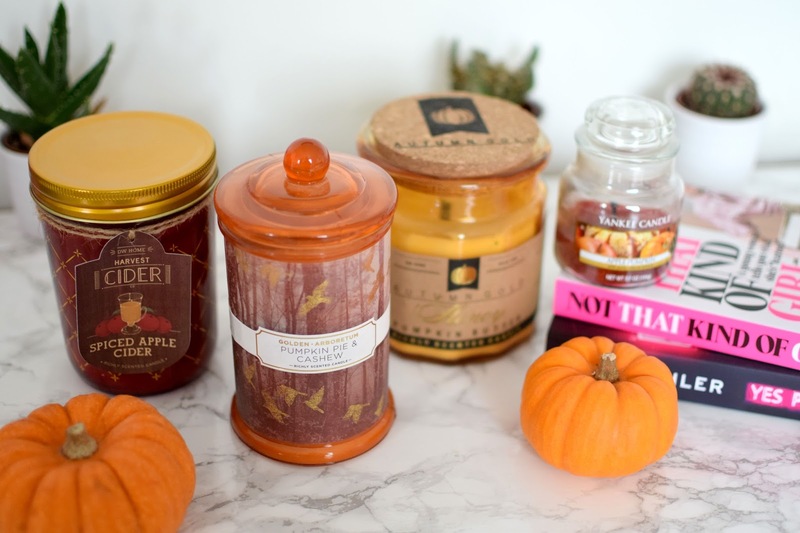 I thought I would do a little round up of my favourite Autumn scented candles that I've been loving recently. TK Maxx/Homesense is my go to for candles, I used to absolutely love Yankee Candles and don't get me wrong, I still do, but they variety they have at TK Maxx/Homesense is second to none! They get the most unique candles in, in terms of scents and packaging, I think a lot of them might be American which isn't surprising. Starting from the left is the Harvest Cider Spiced Apple Cider candle by DW Home. I'm obsessed with the jar and the little label, it's super apple scented but also really sweet and spicy! Nice if you don't like those sickly scents. Next is a Pumpkin Pie & Cashew scented candle which is also by DW Home. Again I think the packaging here is really lovely, so Autumnal. The scent is sweet and spicy, slightly nutty but again not sickly. Then we have a a Honey Pumpkin Butter scented candle . This packaging is so cute! I love the little cork lid. I also really like that this has a wooden wick so you get that nice crackly sound when you're burning it. I think that this candle is very fresh smelling, not spicy but super creamy and buttery. Finally I thought I would throw a Yankee Candle in too, this one is the Apple Pumpkin scent. It's quite similar to the Apple Cider scent but it's a lot fresher which is down to the pumpkin scent, it's still sweet and filled with apple. That's it for my little round up, I'd love to know your favourite Autumn candles or if you have any recommendations! Stay tuned for a Winter Candle Favourites! They all sound fab, I've never thought of going to TK Maxx for candles before! I must go to TK Maxx - I've seen their candles but haven't properly looked! I need too! They all sound lovely (and look nice too)! Very Autumnal. My favourite at the moment is Yankee Candle Salted Caramel - it's so good!